Clubs are queueing up to take Michael Bostwick away from Peterborough United. But Posh director of football Barry Fry insists they would be happy to keep the club’s reigning player-of-the-year at the ABAX Stadium. Bostwick has been placed on the transfer list after reaching the final year of his existing deal in line with club policy. 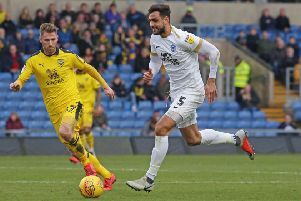 The Peterborough Telegraph understands League One rivals Rotherham, Charlton and MK Dons are interested in the 29-year-old centre-back or defensive midfielder. Fry said: “We are keeping Michael informed of any interest in him, but he knows if we don’t get a suitable offer he won’t be going anywhere.